An information leak becomes a social problem. It may be given a huge loss to a company or individual by an information leak. So we need security software to protect our property. There are much security software for PC, but little security tool for a mobile device.USB Flash Security is a security tool for mobile devices. USB Flash Security can help you to protect you mobile devices by encrypting it. AES encryption which is recognized by speedy. USB Flash Security is disk encryption software encrypt device, protects data. ...... Data will be encrypted automatically by writing in USB memory, and it will be decrypted automatically by reading from USB memory. There are five editions in 'USB Flash Security'. The main difference of each edition is the disk capacity and the number of USB drives. USB Flash Security can be installed to THREE USB drives less than 2TB. 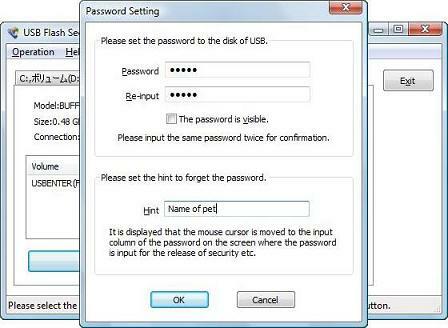 Even if uninstall USB Flash Security from one USB drive, it can be installed to the other one. Qweas is providing links to USB Flash Security 4.1.5 as a courtesy, and makes no representations regarding USB Flash Security or any other applications or any information related thereto. Any questions, complaints or claims regarding this application USB Flash Security 4.1.5 must be directed to the appropriate software vendor. You may click the publisher link of USB Flash Security on the top of this page to get more details about the vendor.